Can't find what you're looking for? Ask any of the helpful staff at Saneal Cameras. They're always more than happy to help. An established Calgary firm with four outlets, Saneal moved its head office to brighter new quarters at 1402 - 11th Avenue SW in the year 2000. The 4000 square foot showroom is filled with complete product lines from all the major manufacturers: Canon, Nikon, Sony, Olympus, Panasonic, Ricoh, Fujifilm, Dji, Sigma, Tamron, Tokina, Rokinon, Rode, Omni, Gopro, Manfrotto, Surui, Sandisk, Silicon Power, Delkin, Lowepro, Thinktank, Meade, Pelican and more!!! 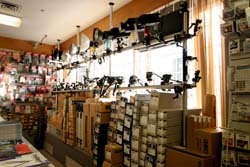 Saneal's extensive selection and helpful staff help ensure that each customer gets the right camera, not just something that happens to be in stock. What's the right camera? It's a camera you will use easily and often, taking pride and pleasure in the results. It's a matter of personal preference and Saneal can guide you through the wide range of available products to find what's right for you. Service and selection have been the mainstays of saneal's long history. 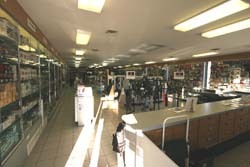 From the beginning, we've always tried to carry as much variety as we can, and we're a full-service shop. We support what we sell. Saneal has made a point of appealing to all consumer levels, with digital cameras and film cameras ranging from simple point-and-shoots to extensive professional level gear. 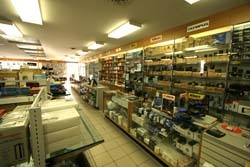 If you need a new slide projector, or just a bulb for your old one, Saneal is the place to shop first. Darkroom buffs haven't been forgotten, either. 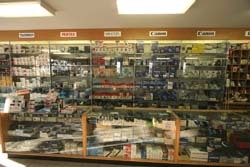 They'll find a full range of paper, chemistry and electronics at Saneal Cameras. With all the optical expertise of its staff, it was logical for Saneal to diversify into telescopes an binoculars. The selection includes spotting scopes, binoculars and monoculars from famous names including Zeiss, Leica and Nikon. And don't miss the Canon image-stabilizing binoculars, which compensate for any unsteadiness in your hands. Amateur astronomers will find Meade telescopes at all price ranges for all levels of users. As we see imaging continue to advance, saneal offers a great selection of drones from industry leading manufacturers like DJI. We also have a strong selection of products and accessories from Gopro and other point-of-view systems. Helping you to be as creative as you can be! Saneal’s first store opened in 1975 in the trans-canada mall in northeast calgary. Since the years we have progressed and grown with calgary and today we offer solutions to everyone who loves photography from 4 calgary locations. 1402 11th ave sw, southcentre mall, market mall and crossiron mills mall. We look forward to seeing in any of our stores!!! !